I amuses me how many movies from the UK ultimately involve the small town struggling against harsh economic realities and the story of how they fight back. Then again, I suppose it's only fair given the significant impact the Margaret Thatcher had and the many, many strikes that happened in response to her policies. Pride seems to follow that movie formula to a tee at first glance, but then it quickly becomes clear that there's more to it. As much as this movie is about a small mining town trying to make ends meet while they remain on strike, it's also about early LGBT activists trying to find a way to gather more support for their cause. And they plan that they come up with involves reaching out to the similarly oppressed miners and hope for the best. I thought that this movie would just be another amusing comedy and one that I could just have fun with before getting back to more important things. But instead it turned out to be quite the powerful movie and also a very moving one. I'm ashamed to admit that by the end of the movie I was in tears given how things resolved. 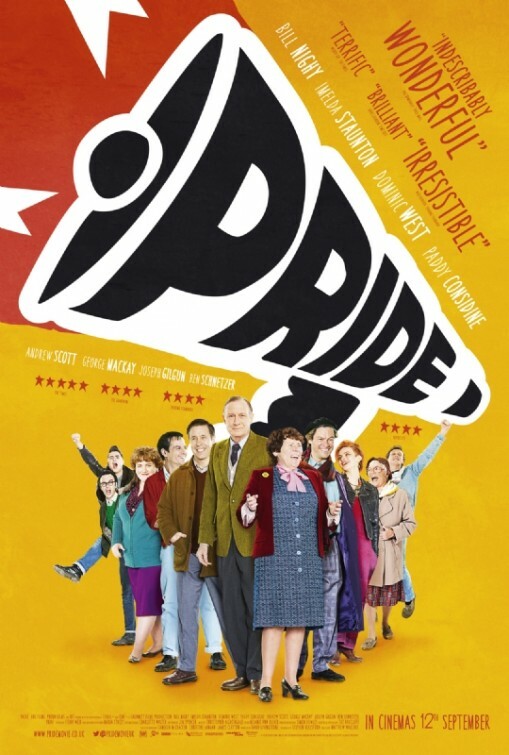 Synopsis: Pride is a 2014 British LGBT historical comedy drama film directed by Matthew Warcus with a screenplay by Stephen Beresford. It's based on a true story and the movie debuted at the 2014 Cannes Film Festival and won the Queer Palm Award. At the core of this movie is Mark (Ben Schnetzer), a gay rights activist in London who one day decides that they should try to raise funds in support of the miners. From his perspective, the only group that is vilified in the press more than the gays would be the miners and so they should be able to relate to the sort of persecution that the LGBT community experiences. Thus they form the group Lesbians and Gays Support the Miners (LGSM), although they only start out with one lesbian. The group starts to carry around buckets and try to solicit donations to support the various miners on strike. But the other challenge is figuring out which community to support. Most mining unions are reluctant to be associated with a gay group and feel the potential stigma will do more harm than good. But thanks to a bit of a confusion over their acronym, they eventually find the Dalais Valley miners in South Wales. After meeting Dai Donovan (Paddy Considine) and eventually other council members Cliff (Bill Nighy) and Hefina (Imelda Staunton), the group makes the first awkward steps towards getting to know the mining community better. It's a learning process on both sides that is not without its challenges along the way. At first glance this feels like a movie that we've seen before. It has the same depressing setting as Billy Elliot. It has a small community trying to find a way to make ends meet like The Full Monty. There are just so many different elements in this movie that feel like things that we've seen before. Even the inclusion of LGBT personalities doesn't seem all that revolutionary since we have the closeted college student Joe (George MacKay), the May-September couple of Jonathan (Dominic West) and Gethin (Andrew Scott) and we even have the token lesbian Steph (Faye Marsay). But somehow the focus on keeping a lighter tone and the way these familiar elements are brought together results in a strikingly endearing movie experience. Parts of the story may feel old, but they don't come across as being tired or stale. Instead the whole thing becomes quite the interesting movie experience, one that thrives on the strength of being inspired by real life events. The filmmakers could have gone with a straightforward documentary drama approach, but instead tried to capture the essence of the pride spirit in how it can uplift the spirit and inspire others. The movie juggles a number of story arcs but does this in quite the even manner. It would have been easy to keep the story solely focused on Mark or we could have more closely followed the story of young Joe and how he eventually comes out of the closet. But instead we have a movie that tells all of their stories as best as possible without letting any one arc dominate or distract us from the others. There's a certain degree of tact and tastefulness in how things were depicted that we rarely see in American movies - and this helps further differentiate Pride from other LGBT films out there. Pride may seem to be a shallow feel-good piece that follows a familiar formula, but in truth it isn't. It's one of the most inspiring and hopeful LGBT movies that I've seen in a while and one that is backed by a stellar cast and a lot of heart. So it's of no surprise that I have to give this movie a full 5 instances of small town ladies being a little naughty out of a possible 5.